At this time of year, with the concentration of getting the Christmas dinner on the table, it’s handy to have a quick vegetable curry recipe to hand, to eat on its own or with all that leftover turkey. This one is from The Hairy Bikers. For the cauliflower, break the two cauliflowers into bite-sized florets and place into a baking tray. Drizzle with olive oil and season with salt and freshly ground black pepper, mixing until well combined. Roast for 20 minutes, or until golden-brown and tender. For the vegetable curry, heat the ghee, or oil, in a large saucepan over a medium heat and fry the onion for 2-3 minutes, or until translucent. Add the ginger, mustard seeds, curry leaves, turmeric, fenugreek, whole green chillies and chilli powder. Cook for 2-3 minutes, stirring frequently, until the mustard seeds pop and become aromatic. Add the potatoes and stir to coat in the spices. Add the tomatoes, spinach leaves, sugar and 55ml/2fl oz water. Bring to a simmer and cook for 20 minutes, stirring occasionally. 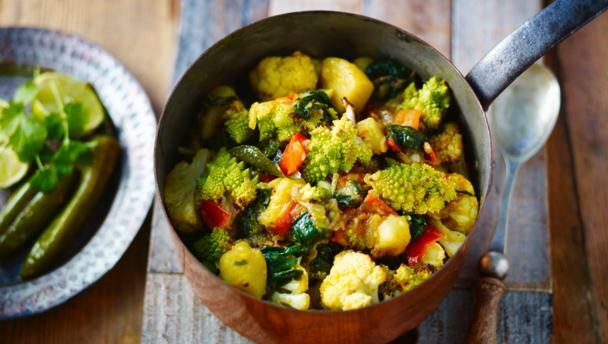 Stir the roasted cauliflower florets into the curry and season to taste with salt and freshly ground black pepper. Add a squeeze of lemon juice to taste. To serve, remove and discard the whole green chillies. Serve the curry alongside steamed basmati rice.